With the increased interest and important role of Oxytocin (OT) in mammalian behavior, physiology and disease, and the difficulty in acquiring cerebrospinal fluid (CSF), there is a critical need to establish valid and reliable methods to measure oxytocin in peripheral fluids. Oxytocin levels have been measured in blood, breast milk, urine, and CSF, but each of these fluids has limitations when appreciating a differential induction of oxytocin. Saliva, however, has the distinct advantages of being both non-invasive and readily accessible, thus allowing for in-depth monitoring of peripheral oxytocin levels under basal and stimulated conditions. This makes salivary oxytocin testing the right choice for oxytocin research. Salimetrics has recently developed a breakthrough assay and is now offering the opportunity to measure salivary oxytocin levels in a simple, reliable and sensitive manner using very low sample volumes. This new development represents an enormous advancement to the field of behavioral sciences with widespread applications. Oxytocin signaling modulates a wide range of central and peripheral physiological responses. Most notable to the medical community are uterine contractions during labor, milk let down during nursing and male ejaculative functions (Braude et al., 2012; Filippi et al., 2003) Functions of oxytocin that are of interest to the behavioral research community include parental behavior, the formation of social bonds, and the management of stressful experiences (reviewed (Lee et al., 2009; Tom and Assinder, 2010)). Historically, the science behind salivary oxytocin testing has been somewhat controversial and limited by the methods used to detect it. In 2005, researchers concluded that human saliva was not a valid oxytocin source (Horvat-Gordon et al., 2005; Leng and Sabatier, 2016; McCullough et al., 2013). However, since then, researchers have demonstrated detectable levels of oxytocin in saliva samples, using both non-extracted and extracted saliva samples (Carter et al., 2007; MacLean et al., 2018). There is also considerable debate regarding the forms of oxytocin detected by each method. Research using plasma and serum has established that oxytocin exists both as a cyclic molecule and complexed with other disulfide containing proteins (Brandtzaeg et al., 2016; Martin, 2016). This natural tendency of oxytocin to covalently adhere to proteins through disulfide exchange results in free and bound oxytocin pools. An implication of this is that levels measured by methods that only detect the free form may underestimate the total amount of oxytocin present, and some researchers have argued that sample pre-processing is required. Recent LC-MS evidence supports the conclusion that oxytocin concentrations in blood are considerably higher than previously thought and that the low levels were simply due to the inability to detect oxytocin molecules when bound to plasma proteins (Brandtzaeg et al., 2016; Martin and Carter, 2013; Szeto, et al., 2011(Martin, 2016)). In each of these studies, solid phase extraction (SPE), is commonly recommended by many commercially available ELISA kits to reduce matrix effects and eliminate interfering molecules, and this was also shown to reduce measurable oxytocin levels significantly. In practice, most researchers publishing in the literature today choose to concentrate saliva samples as an alternative to extraction. The increased analytical sophistication described above has resulted in a more thorough appreciation of the various forms of oxytocin with the result being an acceptance of its validity as a salivary biomarker. Understanding of the different methods available to researchers as they pioneer increased understanding of oxytocin-regulated biological processes is a critical factor for the advancement of the field. Salimetrics has introduced a ground-breaking assay developed on a highly sensitive platform for the detection of oxytocin in whole, non-extracted saliva. This newly developed assay has been rigorously validated with regards to measurement accuracy, precision, sensitivity, specificity and reproducibility. We have eliminated the need for either extraction or concentration by creating an assay with unmatched sensitivity and low sample volume requirements. 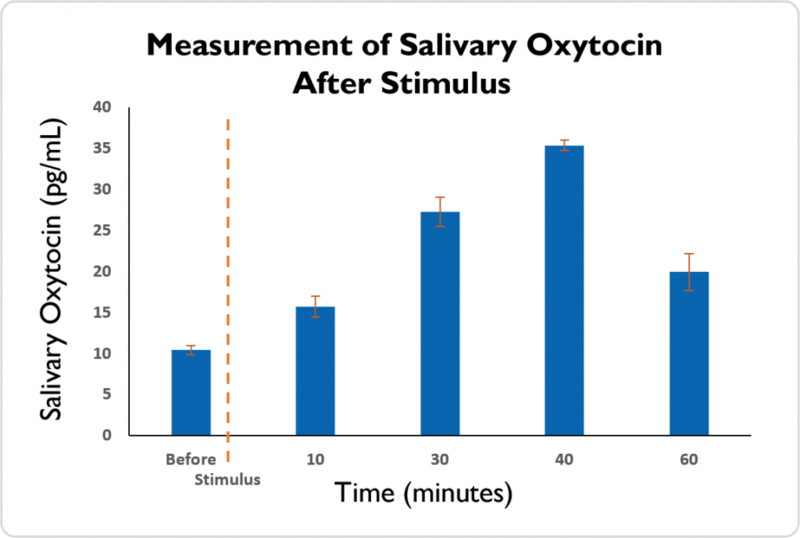 As shown in the figure below, internal studies show increases in salivary oxytocin levels in response to stimulus, including massage and sexual stimulation, see example figure. Salimetrics’ state of the art assay is now available as a testing service for investigators seeking the most reliable and reproducible, quantitative measurement of oxytocin in saliva. Brandtzaeg, O.K., Johnsen, E., Roberg-Larsen, H., Seip, K.F., MacLean, E.L., Gesquiere, L.R., Leknes, S., Lundanes, E., and Wilson, S.R. (2016). Proteomics tools reveal startlingly high amounts of oxytocin in plasma and serum. Sci Rep 6, 31693. Braude, S., Goran, D., Miceli, A., and Chiras, D.D. (2012). Case studies for understanding the human body, Second edition. edn (Sudbury, MA: Jones & Bartlett Learning). Carter, C.S., Pournajafi-Nazarloo, H., Kramer, K.M., Ziegler, T.E., White-Traut, R., Bello, D., and Schwertz, D. (2007). Oxytocin: behavioral associations and potential as a salivary biomarker. Annals of the New York Academy of Sciences 1098, 312-322. Filippi, S., Vignozzi, L., Vannelli, G.B., Ledda, F., Forti, G., and Maggi, M. (2003). Role of oxytocin in the ejaculatory process. J Endocrinol Invest 26, 82-86. Horvat-Gordon, M., Granger, D.A., Schwartz, E.B., Nelson, V.J., and Kivlighan, K.T. (2005). Oxytocin is not a valid biomarker when measured in saliva by immunoassay. Physiology & behavior 84, 445-448. Lee, H.J., Macbeth, A.H., Pagani, J.H., and Young, W.S., 3rd (2009). Oxytocin: the great facilitator of life. Prog Neurobiol 88, 127-151. Leng, G., and Sabatier, N. (2016). Measuring Oxytocin and Vasopressin: Bioassays, Immunoassays and Random Numbers. J Neuroendocrinol 28. MacLean, E.L., Gesquiere, L.R., Gee, N., Levy, K., Martin, W.L., and Carter, C.S. (2018). Validation of salivary oxytocin and vasopressin as biomarkers in domestic dogs. J Neurosci Methods 293, 67-76. McCullough, M.E., Churchland, P.S., and Mendez, A.J. (2013). Problems with measuring peripheral oxytocin: can the data on oxytocin and human behavior be trusted? Neurosci Biobehav Rev 37, 1485-1492. Tom, N.C., and Assinder, S.J. (2010). 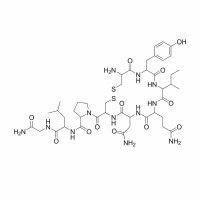 Oxytocin: recent developments. Biomol Concepts 1, 367-380.